The majority of our journey is now spent on the Murray Valley Highway in Victoria. As we continue west, north-west with the Murray, we travel through irrigated country around Kerang finally getting to Swan Hill and the beginning of the mallee region. Swan Hill offers some great attractions including strong culture, wonderful food and vibrant community. Swan Hill is also home to the Pioneer Settlement Museum that showcases life as it was from 1830-1930. More than 50 original buildings from the Murray-Mallee area have been saved and lovingly restored to recreate a town. The open museum can be explored on foot or tour aboard a horse and cart or vintage car. The after-dark sound and light show is a popular choice. The river then still heading north-west enters Robinvale and Euston. The soil beginning in this area is great for citrus and other produce. Towns along this stretch of the river thin out, yet the beauty of the river really opens up into a new wider style. Even larger Redgums begin to appear near it's edge and you see a different side to the Murray. Not far from Robinvale is Mildura. On the border of the Mallee and outback, Mildura was originally established from a sheep station into a key irrigation district in the late 1800's from the abundance of the Murray. Famous for it's sunshine and known as Sunraysia, Mildura is another paradise along the Murray. Nowadays many different crops are grown in Mildura and it's surrounding towns like citrus, grapes, mushrooms, olives and nuts. 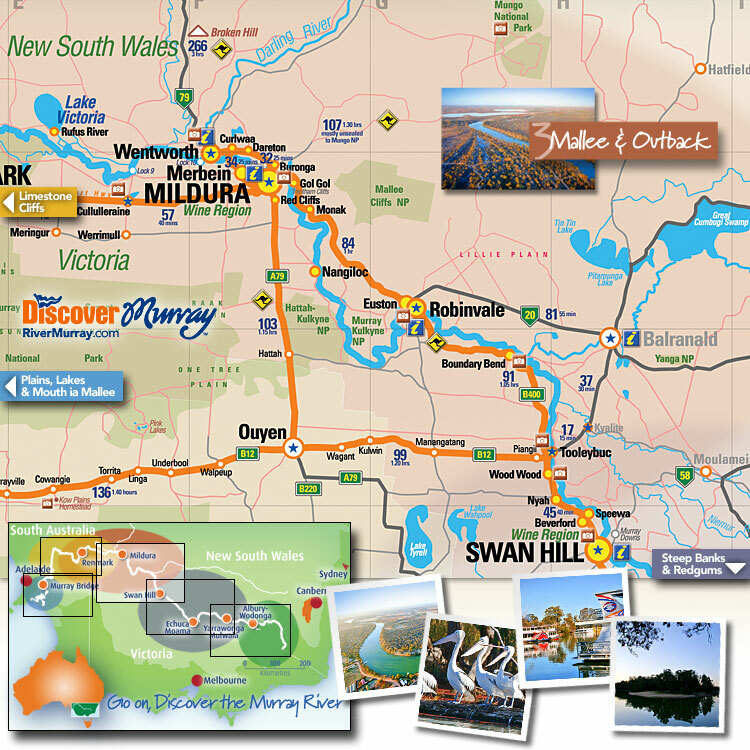 Mildura offers the visitor all you need for a great holiday and river experience. From Melbourne, Mildura is a great way to experience the outback and access Broken Hill. You can take a Harry Nanya Tours adventure across to the NSW border and the World Heritage-listed Mungo National Park. Arrive before sunset and you'll marvel at the changing colours and moonscape-like appearance of the famous Walls of China dunes. It's a trip back in time, where the bones of ancient man are said to date back 35,000 years. Just west of Mildura is Wentworth where Australia's longest river the Darling meets with the Murray. The Darling River winds it's way from the southern region of Queensland all the way through the Basin in New South Wales.